I've made several printable Mormon Word Search puzzles that you can print out for free. The word searches I have right now are all from the Book of Mormon. Word searches are a fun workout for your brain and can also be used as educational aids. If you have an idea for an LDS-related word search, send me the word list. I may be able to make a word search puzzle for you at no charge (see below). You have my permission to print out the Mormon Word searches below for personal, classroom, or church use. Make as many copies as you need. You can save the pages to your computer and/or share them via email to anyone. All I ask is that you keep the copyright notice at the bottom of the puzzle page in place. For more word searches, see my Word Search Printables page. I've got free printable word searches there on many themes, including Bible word searches. Here are the Mormon Word Search printable pages. Click the link to open a printable version of the word search in a new window. See below if you need the solutions. Some of the word lists I used to create the puzzles above were provided by LDS member Donna Homer. Others were provided by Jane McGilvray. Thanks, Donna and Jane! If nothing happens when you click the link, you might need to install free PDF reader software on your computer. This can be found at various places online such as Adobe.com. I've printed out and checked all the word searches myself. So if you can't find a word, don't give up - it's in there. These printable Mormon word searches are a 15 by 15 grid of scrambled words. Looking at the puzzle, all you see what appears to be a random jumble of letters in a square shape. There are words are hidden within the puzzle. The list of words you need to find is shown below the puzzle. Your job is to find the hidden words and circle them. See example at right. Words are not just horizontal in the puzzle. They may also be vertical, diagonal, or even backwards. The letters of a particular word are always in a straight line within the puzzle. As you find each word, cross it from the list. This helps you keep track of the words you still need to find. The hidden words in all capital letters in the word list. Ignore the lower case words from the word list when searching the puzzle. For example, in the Account Written by the Hand of Mormon word search, one of the clues in the word list is "People of NEPHI". As you can see, the word NEPHI is in all caps. That means you need to find and circle just the word "NEPHI" in the puzzle. The "People of" part of the phrase is not hidden in the word search. I have the Answer Key for each of these Mormon word searches. I printed them out, solved them, and made a screen image of the solution. So if you can't find a word in one of the puzzles - keep looking! It's there. 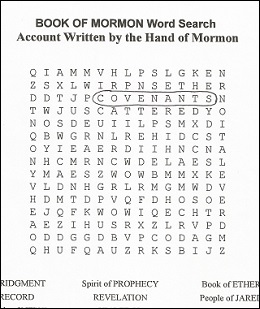 Have an idea for a printable Mormon Word Search puzzle? Send me the list of words you want hidden in the puzzle. and I'll make a printable word search for you for free. Please include about 15 to 18 terms in your word list, and provide a title for the word search. For example, "Life of Joseph Smith". Use the form on my Contact Me page to send me your request.